A thread lift is a type of procedure wherein absorbable barbed sutures are used to produce a subtle but visible "lift" in the skin. Instead of removing the patient's loose facial skin surgically, the plastic surgeon simply suspends it by stitching up portions of it. This has the effect of pulling the skin back slightly and therefore lifting and tightening the face. In addition to being ideal for lifting the skin, threads combat aging in another way: by provoking the body's "healing response" and causing the body to direct large surges of collagen to treated areas. This is important because of the vital role collagen plays in the aging process. How Is Thread Lift Performed? Thread lift is an outpatient office procedure. Before starting this procedure, a numbing cream or local anesthetic will be applied to the skin. After which, fine threads are advanced under the skin towards the area of desired correction. These threads have fine barbs that become fixed to the tissue. Finally, Dr. Ahmadi gently pulls on the suture to lift and improve the sagging tissue. New bundles of collagen which surround each filament are produced by the body and this in turn creates a subtle yet effective lift. The results differ for each person, but it looks very natural thus giving a rejuvenated and refreshed look. There is no scarring and recovery time is significantly less as compared to traditional surgery. How Does Thread Lift Slow Aging? Collagen helps support "growth factors" that greatly influence the condition of our skin. In addition to being used for wound healing, collagen helps to keep our skin strong, voluminous and supple. As we get older, our bodies gradually produce less and less collagen, which leads to an 80% reduction in skin thickness by about age 70. This loss of volume and strength is a large factor in the creation of excess skin and wrinkles. As the skin grows weaker, it's no longer able to support the tissues beneath it adequately, meaning that gravity pulls it downwards and stretches it. Infusing the skin of the face with fresh collagen when the signs of skin laxity are still mild can help to both reduce looseness (by thickening and hydrating the skin) and prevent it from getting worse (by strengthening the skin). In other words, this process provides ongoing and progressive rejuvenation of the facial tissues. Patients who have a thread lift for the purpose of stimulating collagen will notice a gradual improvement in their skin's tone and firmness. While their threads are in place, the body's healing response will be constantly activated because the body will want to "heal" the sutured areas and expel the sutures. The body is biologically programmed to react this way when it senses any foreign object present within the dermis. Fortunately, because the threads placed under the skin during a thread lift are so small, the patient will not feel any of this happening. Most people cannot feel their sutures at all once the skin has healed around them. What Are The Thread Lift Sutures Made Of? Thread lift sutures are most commonly made of biocompatible material designed specifically for safe re-absorption by the body. The same material has been used for many years in surgical sutures for many kinds of surgical procedures. What Areas Can Be Treated With The Thread Lift? The thread lift can be used to improve the appearance of a sagging neck, sagging cheeks and jaw line. You can personalize your procedure to suit your exact needs and Dr. Ahmadi will also make recommendations for improvements. The procedure can be customized to suit your exact needs to ensure that you are totally happy with the results. What Are The Advantages Of A Thread Lift Over A Face Lift? The great thing about a thread lift is that it offers quick recovery together with excellent results. This procedure requires no invasive surgery and leaves no scarring. Only Local numbing is required and there is no need for a hospital stay. Another good factor about the thread lift is that it is much more affordable than a regular face lift. Thread lift is the perfect solution for you if you are looking for a quick and effective solution to a range of ageing problems. A thread lift is suitable for men and women who are in their late thirties to early fifties. The procedure is most effective on skin that has minimal sagging and offers the optimum results for cheeks, jaw line and the neck area. 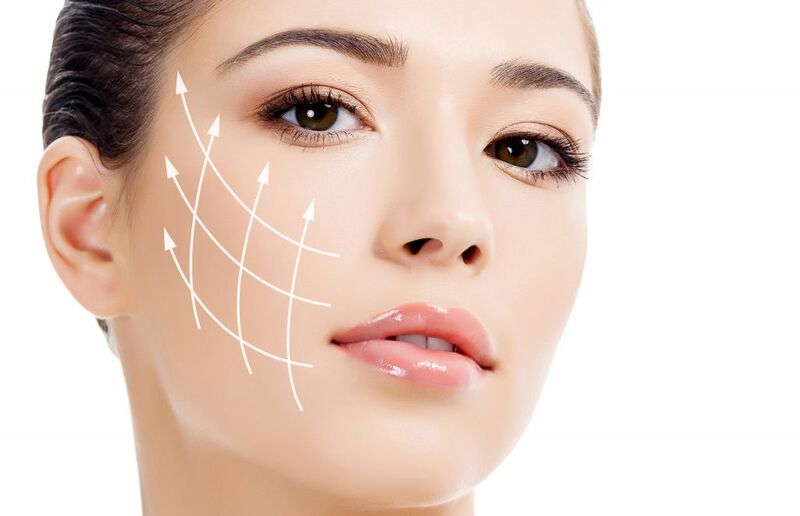 Thread lift is the ideal choice if you are looking for results that are more effective and long lasting than Anti-wrinkle Injections and fillers. If you are put off by traditional surgery, then thread lift is a great alternative as it is minimally invasive and can be carried out under local analgesic. What Are The Risks Of Thread Lift? No surgical procedure is done without involving risk, but the level of risk is often reduced depending on the expertise and experience of the surgeon carrying out your procedure. Thread lifts may have minimal side effects for e.g. bruising, swelling, infection, softness or numbness of skin. All side effects will be explained in detail to you during your consultation and before you book the appointment for the thread lift treatment. If you choose the right doctor, these side-effects will only last a few days and you’ll be able to catch up with normal routine. A typical thread lift takes less than one hour to perform, but the length is dependent on the number of filaments your doctor uses and the areas being treated. What Happens After A Thread Lift Procedures? You will be provided with aftercare instructions to follow once the procedure is complete. These will help to relieve any distress and help to speed up the process of healing. For the first couple of days you can use ice compresses to deal with any swelling and help to reduce discomfort. Most patients experience some mild swelling, but this is usually quick to settle. Recovery times are usually less than a couple of days although strenuous exercise, vigorous massaging of the face, and forceful chewing and opening of the mouth should be avoided for a week. How Long Do The Results Of Thread Lift Last? A thread lift’s lasting power relies on the age of the patient at the time of procedure and the amount of thread lift corrected by sagging. Many doctors report that the results last for anywhere from 6 months to a year, but it should be noted that sagging will return over time. To extend the results it is possible to have additional filaments inserted and your doctor can suggest when this is needed. What Other Procedures Can Be Done At The Same Time As A Thread Lift? Because thread lifts are so low-risk and boast such a short recovery time, it's possible to combine them with other nonsurgical procedures in order to create more comprehensive, noticeable results. Neuromodulators, fillers, skin resurfacing modalities can be combined with thread lift safely to correct issues that thread lifts cannot. It's best to ask Dr. Ahmadi for his recommendation at the time of consultation to find out what additional procedures are recommended for you.